Identification: This is a small species with a translucent greenish body densely flecked in cream. The parapodia are moderately high with three broad chimneys and the rhinophores are relatively long. Clustering of the cream flecks forms irregular bands on the sides of the parapodia. It may be distinguished from the similar appearing Elysia lobata by the narrow greenish-maroon submarginal lines on its parapodia and the pink patch on top of its head. Natural history: Elysia sp. #2 is a moderately common species found in rocky habitats (particularly back reef areas) at depths of < 1 to 3 m (< 3 to 10 ft). It occurs in protected to moderately exposed locations. Mature animals are diurnally active and jerk their parapodia occasionally while crawling. Its egg mass is yellow and usually composed of only 1 to 1.5 whorls. A small amount of reticulate, cream extra-capsular yolk may be closely associated with the eggs. Distribution: Maui and Kauai: widely distributed in the Indo-Pacific. Taxonomic notes: First recorded in Hawaii from Hekili Point, Maui by CP in Sept. 1990. 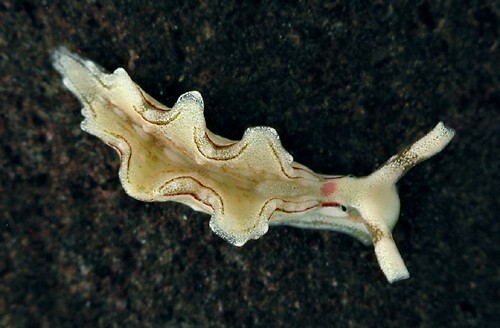 Photo: CP: 5 mm: found by PF; Mala Wharf, Maui; May 2, 2006.